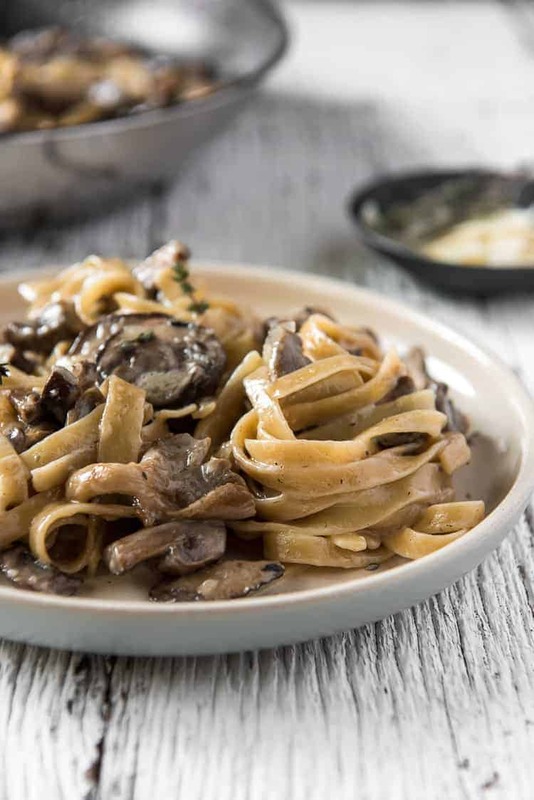 Ideal for special occasions and Meatless Mondays alike, this easy Creamy Brown Butter Mushroom Pasta is a great way to weasel into someone’s heart! A pound of mushrooms, butter, cream, and Parm come together to make your favorite pasta even tastier! We’re off to Comfort Food City today, folks. So it’s no secret that I’m no fan of Valentine’s Day. I’m a happily married woman, but I’d much rather be surprised with roses or a sweet card in May, August, or November than be expecting it one specific day a year. But…it IS only a few days away, and it would be irresponsible of me as a blogger to not recognize it. I figured this would be a great week to share my ideal romantic dinner. I may not like commercial holidays advocating love, but I still love to eat, you know? Since today is Meatless Monday anyway, why not start with one of my very favorite pasta dishes? 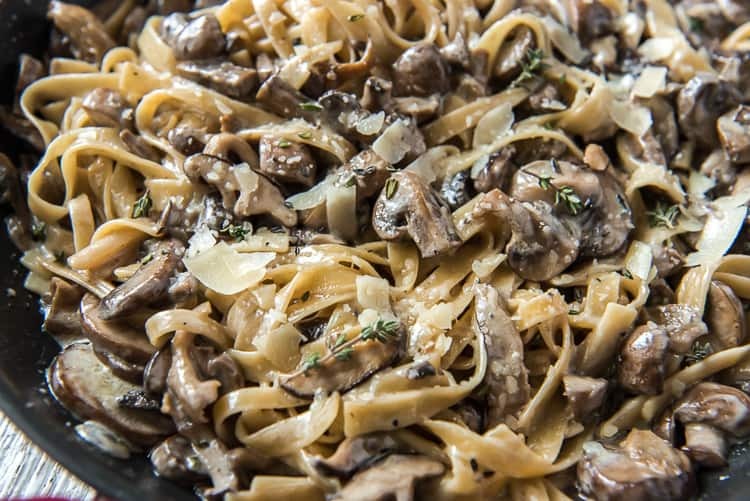 JUST TAKE ME TO THE CREAMY BROWN BUTTER MUSHROOM PASTA ALREADY! 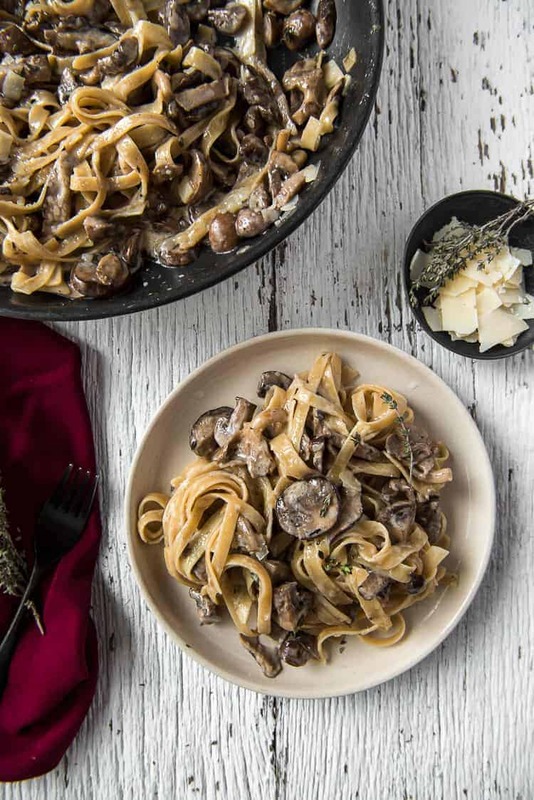 If you’d rather skip my (pretty darn helpful) tips and tricks, essential cooking info, and similar recipe ideas – and get straight to this deliciously easy mushroom pasta recipe, just scroll right on down to the bottom of the page where you can find the printable recipe card! I used to hate mushrooms. Despise. Loathe. Abhor. All the adjectives. The texture never did anything for me, and the flavor was just meh. Thank goodness for changing, maturing tastes. If, by chance, you’re in the same spot, give this deliciously creamy, buttery mushroom pasta a try. I promise, it might just change your mind about these darling little fungi. Especially since they’re bathed in the most luscious brown butter cream sauce ever! Easy pasta recipes are one of my favorite weeknight meals for so many reasons! Not only are they quick to throw together, they also use minimal ingredients, most of which you probably have on hand. and fettucine here as it’s what I had on hand. You can also use standard spaghetti, angel hair, or linguine – or whatever else floats your pasta-lovin’ boat! Whatever you use, be sure to cook it slightly al dente (firm to the bite). 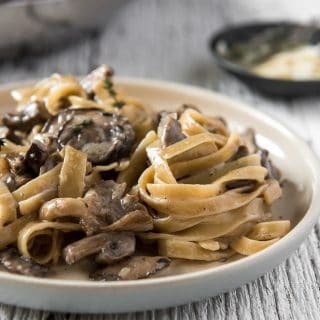 You will be cooking it a bit more in the mushroom sauce, and mushy pasta is a no-no! When you drain your pasta, make sure you reserve at least 1/4 cup of the pasta water for later. It will be used to keep your sauce at the right consistency. While the pasta is boiling, brown a stick of butter in a large skillet (I use unsalted, but if you prefer salted, keep an eye on your salt additions). When it foams, stir in a pound of sliced and quartered mushrooms and a pinch of salt. YEP. 1 pound. Since there’s no meat in here, these babies act as your protein, and the more, the better! I used a mixed blend of baby portobello, shiitake, and oyster mushrooms for a nice flavor blend. Feel free to use your favorite type. After the mushrooms cook down a bit, add some minced garlic and cook it until it is fragrant, about 1 minute. Adding it too soon can result in burned garlic, which no one loves. Next, toss in that drained pasta and stir it around to break up any clumped noodles. Then add some heavy cream and lemon juice, and season the whole thing with salt and pepper to taste. Let everything simmer for a bit to warm up before adding in your Parmesan cheese and thyme. If your sauce begins to clump at this point (which it likely will), stir in some of that reserved pasta water. The starch from the noodles will help smooth out and thicken the sauce, giving you that gorgeous, glittering skillet of love you’re looking for. Serve immediately, topping it with more Parm if you want, and a sprinkle of fresh thyme and black pepper. LOOKING FOR MORE 30 MINUTE PASTA RECIPES? 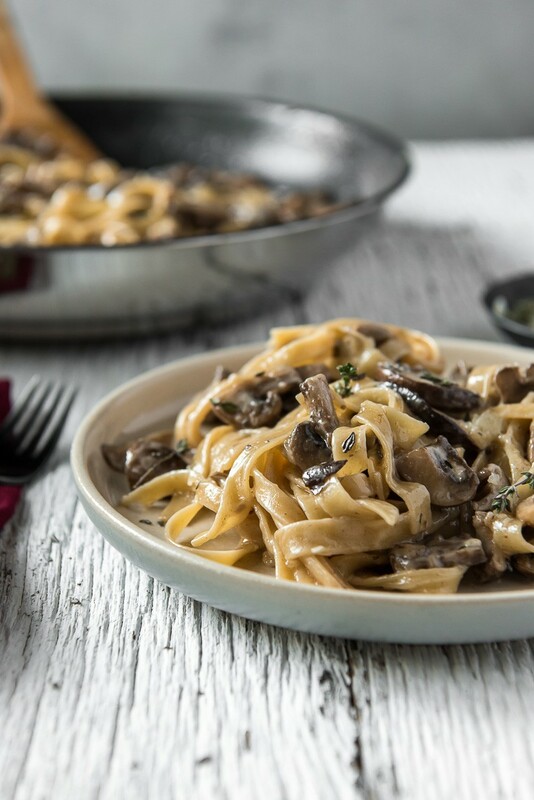 Ideal for special occasions and Meatless Mondays alike, this easy Creamy Brown Butter Mushroom Pasta is a great way to weasel into someone's heart! A pound of mushrooms, butter, cream, and Parm come together to make your favorite pasta even tastier! Cook the pasta in boiling salted water until al dente. Drain, reserving ¼ cup pasta water. Meanwhile, melt butter in a large, non-stick skillet over low heat until the butter starts to foam. 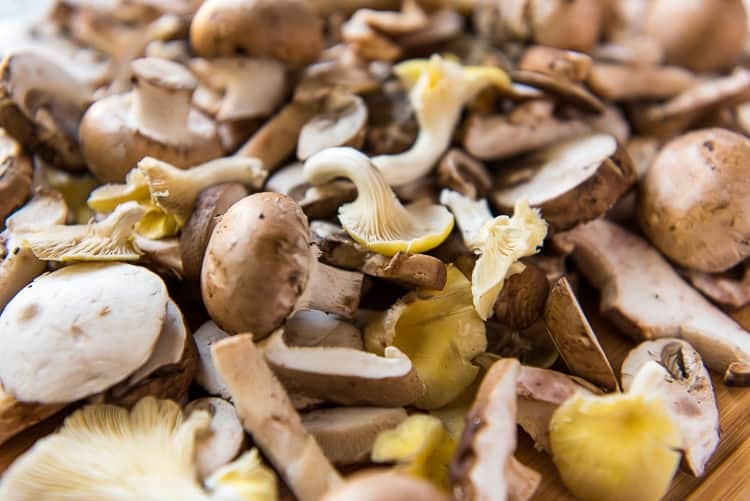 Turn heat up to medium and add the mushrooms and a pinch of salt, stirring frequently for 5-6 minutes until they begin to cook down. Add garlic and cook an additional minute. 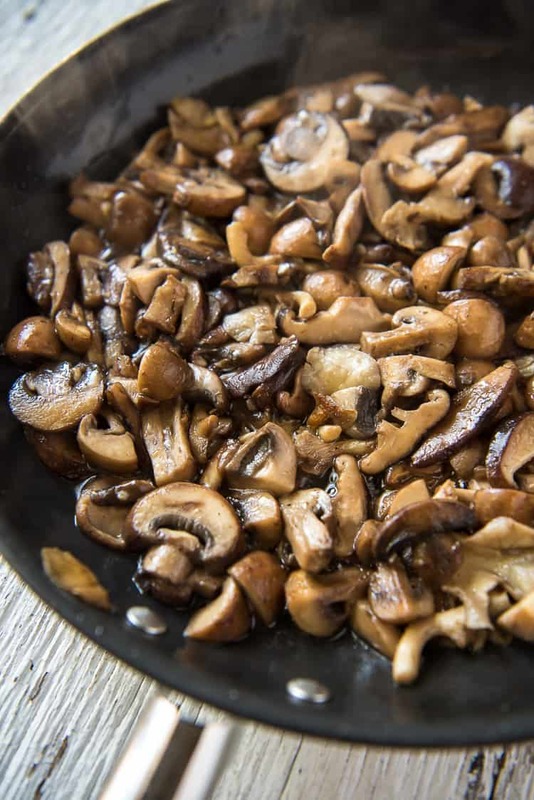 Add the drained pasta to the skillet with the mushrooms, stirring to break up any clumps. Stir in heavy cream and lemon juice, and season to taste with salt and pepper. Add Parmesan, thyme, and enough pasta water to keep the sauce from clumping. Remove from heat, tossing the pasta gently to coat. Serve with extra Parmesan and a sprinkle of fresh thyme, if desired. Feel free to add sliced grilled chicken or steak to this for a heartier meal! 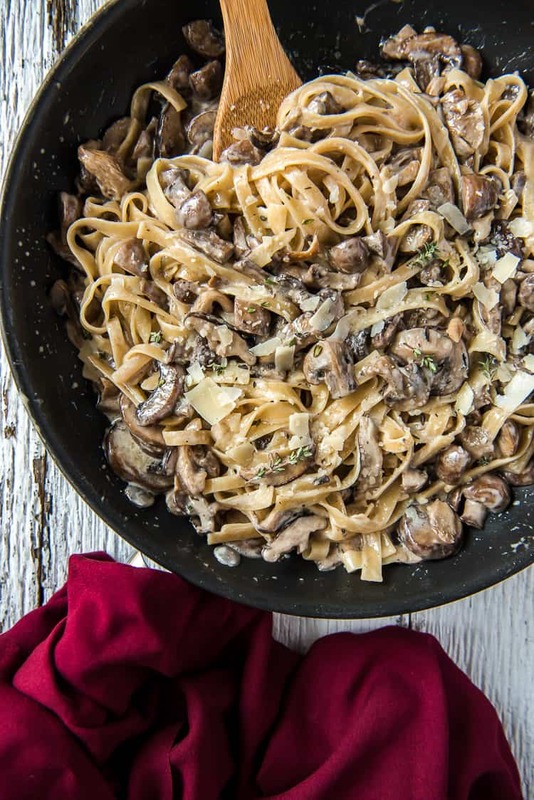 PIN THIS MUSHROOM PASTA RECIPE FOR LATER! I made this for Valentines Day dinner. It was delicious. The brown butter definitely added to the flavour of the dish. Definitely would make it again.